You’re on crutches this winter. There’s nothing you can do about it. You simply have to live with it and make the most of it. While it would be safest to stay at home all winter long, you know holing up would drive you crazy. Plus, you have to get to your grandkids activities! Crutches and snow and ice are not a good mix, but the good news is, you have options! Here are a few alternatives to crutches that are much safer when it comes to traveling on the snow and ice. One of the safest ways to travel on snow and ice when you have a foot or ankle injury is by wheelchair. You don’t have to worry about slipping and falling, and you don’t have to be concerned about hitting an unexpected slick spot. The problem with a wheelchair is you either need someone to push it for you, or you need to be strong enough to sludge through the snowy parts yourself. The wheelchair can also be hard to transport when you are trying to get into a car and fold it up behind you. If you like having the use of your hands to pick up your grandkids, do your grocery shopping, and just live everyday life, the Hands-Free Crutch is a great option for you. This device straps right to your bad leg. As long as you can kneel comfortably, you can use the Hands-Free Crutch. It is safer in the snow and ice because it allows you the use of both hands to hold onto people or things to prevent a fall. If you want something that is easy to jump on and off but is also something safer in the snow, the Knee Scooter might be for you. If you can kneel comfortably, you just put your knee on the padded seat and push yourself through the snow and over the ice. The device is on wheels and will keep you stable in the mushy sludge of winter. Since you have hand grips to help guide you, the likelihood of a fall is much smaller. Much like the Knee Scooter, this device is on wheels. The difference is you sit and scoot, which is even safer than kneeling, and you do not have to include your knee if you can’t kneel for long. 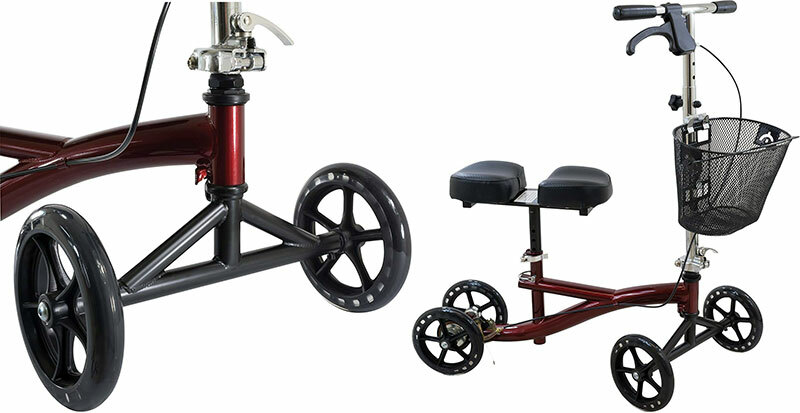 The Seated Scooter easily folds up and can be placed in your car. It’ll give you a place to rest no matter how long you are out. And it’s even fun for the grandkids to ride! When it comes to your safety, don’t let your pride get the best of you. If you really want to get out and nothing can stop you, don’t let your pride get in the way either. Have your strong son carry you from the car and into the house. It might take you back to the good old days when you were the one giving the piggyback rides. Sure, it’s not ideal, but at least you got there in one piece and can enjoy the family event! One person shared the story with us that her son in laws arrived on Christmas Eve and picked her up in her chair to “deliver her” to their wives. They said her presences was the gift their wives really wanted. They didn’t mention if they gift wrapped her. 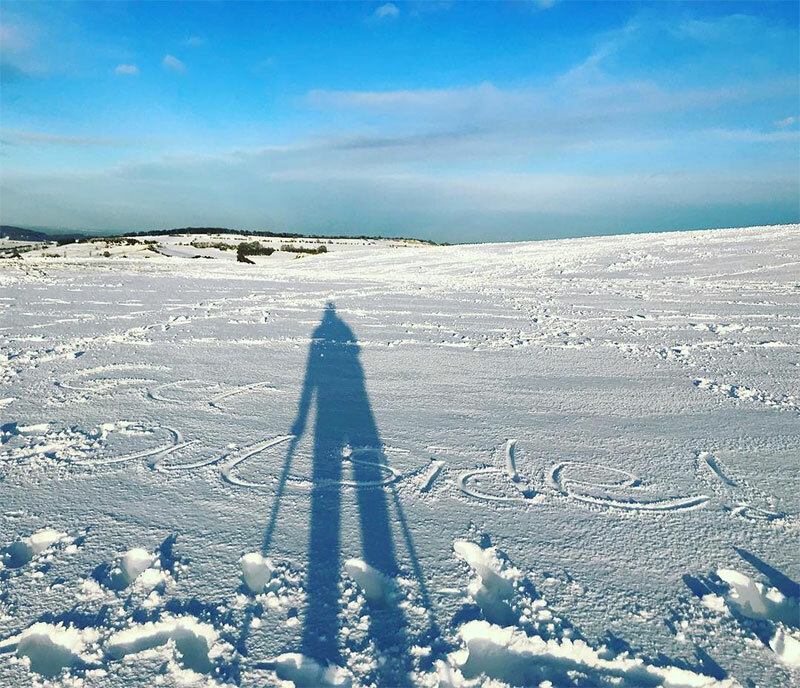 Winter will be tough on your recovery…especially when it comes to staying active as you so desperately want to do. But with the above mobility options, a little snow and ice won’t keep you away from the events you really want to attend.